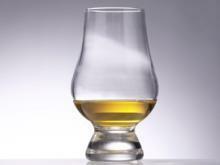 Auchentoshan's standard malt is popular with casual whisky drinkers, because it's so approachable. Auchentoshan are the only Scottish producer to triple distill all their malts, and it gives a style which is always very smooth, although Auchentoshan is certainly richer than most Irish whiskies. The theme of lightness and balance is evident on the nose, with gentle malty cereal notes – even grass – and a subtle tang of sweet sherry. To taste, it's a soft whisky, with no fiery burn to it, and there's just a hint of orangey fruit to it. The gentle maltiness and sweet sherry return, rounds off the dram in an easy, mellow finish. Such an easy-going light malt is perfect for a Burns Supper or other occasions when it's not just the die-hards gathered together – even the non-whisky drinkers will find it very welcoming and approachable.